This Hawkesbury Development Control Plan 2002 (DCP) contains guidelines for applicants, as well as others involved and interested in the development of the City. The DCP compliments the statutory provisions contained in the Hawkesbury Local Environment Plan 2012 (the LEP). Pitt Town Development Area - Draft Indicative Road Layout for "Precinct D"
On 8 February 2015 Council adopted an indicative road layout for "Precinct D" in the Pitt Town Development Area as an interim policy of Council. This Policy is to be read in conjunction with Part E Chapter 4 Pitt Town of the Hawkesbury Development Control Plan. On 24 November 2015 Council adopted the Pitt Town Development - Updated Stormwater Management Strategy as an update to the technical provisions referred to in the Hawkesbury Development Control Plan. This Strategy is to be read in conjunction with Part E Chapter 4 Pitt Town of the Hawkesbury Development Control Plan. This Development Control Plan (DCP) is the Hawkesbury City Council Growth Centres Precinct Development Control Plan 2017. It has been prepared pursuant to the provisions of Section 72 of the Environmental Planning and Assessment Act 1979 (EP&A Act). 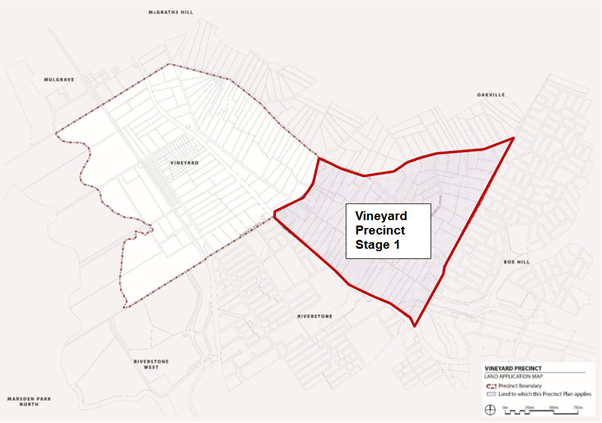 This DCP applies to all development within land identified as Stage 1 of the Vineyard Precinct, as illustrated in Figure 1 below. This DCP was adopted by the Secretary (or delegate) of the Department of Planning and Environment on 8 January 2018 and came into force on 18 January 2018.